President Obama phoned the Mars Science Laboratory (MSL) team on Monday, congratulating them on their amazing Entry, Landing and Descent (EDL) efforts that resulted in NASA’s Curiosity rover landing safely on the surface of Mars. He also joked that if Curiosity makes contact with Martians, the Jet Propulsion Laboratory (JPL) team should inform him right away. 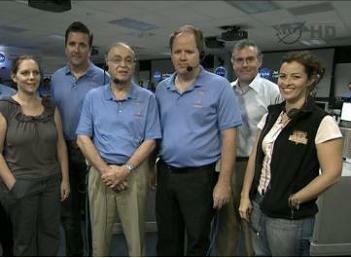 The President phoned the mission control room at JPL, to congratulate Center Director Charles Elachi and the Mars Science Laboratory team currently operating the rover, which landed on Mars a week ago. The EDL success was nothing short of amazing, debuting the SkyCrane method of gently placing the large Rover just 2.4kms from its target on the flat area of the Gale Crater, a deep depression located on Mars’ equator – some achievement when taking into account the entry speed of Mach 24, just seven short minutes prior to the touchdown. Although additional EDL data will be gathered in the short term, engineers believe a tail wind may have been one of the factors as to why they landed ever so slightly downrange of the target. The Rover is currently sat patiently on the “Red Planet” during her checkout operations, with the major task of transitioning Curiosity’s two main computers to a version of software suited for the vehicle’s work on the surface of Mars heading into its final phase. 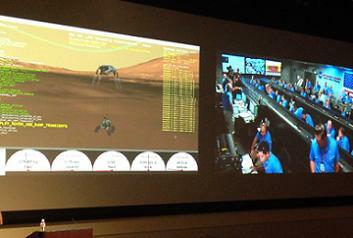 Prior to the transition, Curiosity’s computers used a version of flight software loaded with the EDL capabilities that are no longer required for the rest of the Rover’s operational lifetime. 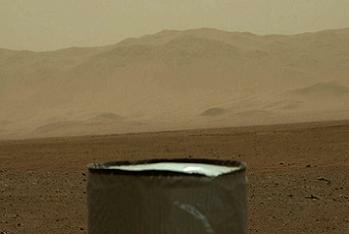 Based on the current timeline, Curiosity is expected to stretch her wheels as early as next week. That first movement will allow for the initial checkouts to access the status of the Rover’s primary exploration assets, lasting a few additional weeks. All checkouts to date – including radiation measurements, camera evaluations and the lofting of MSL’s all-important Mast – have all been deemed successful. The Gale Crater landing site at 4.59 degrees south, 137.44 degrees east, places the rover within driving distance of layers of the crater’s interior mountain. Observations from orbit have identified clay and sulfate minerals in the lower layers, indicating a wet history. The Rover has already taken a few vacation snaps, showing the crater rim and features of Mount Sharp. Although there has been a drop-off in public interest in the mission since the intense EDL events, President Obama firmly placed Curiosity back into the news via his phone call with the assembled team at the Mission Control Room in California. “I just wanted you to know we could not be more excited about what you’ve been doing,” noted the President in his opening comments, before moving on to the more jovial subject of the shy locals in Curiosity’s neighborhood. 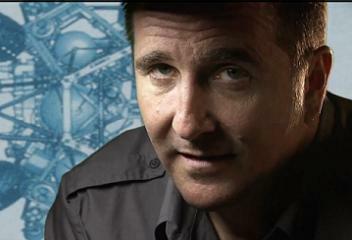 “Somebody asked me the other day if you have already found Martians. I told them we have to give you a little bit of time. Large parts of the call was dedicated to the more serious nature of the mission, heaping praise on the team, including the most notable names to find their way into public fandom – such as charismatic EDL lead Adam Steltzner and “Mohawk Guy” Bobak Ferdowsi. He also noted the inspirational aspects of the mission for the next generation. The only problem with the next step up, from the robotic to the human exploration of Mars, is the leap in technology required to transport, sustain and return a crew safely from a mission involving the Red Planet. NASA managers have had plans for such missions for decades, always at least a few frustrating decades into the future, something that continues to be the situation with the latest Mars mission proposals. Officially, NASA leaders do not sway from the “company line” of saying the often-repeated “sometime in the mid 2030s” sound-byte. Internally, the Exploration Roadmap planning phase – otherwise known as the Design Reference Mission (DRM) documentation (L2 LINK) – only lists the missions as “TBD – To Be Determined”. 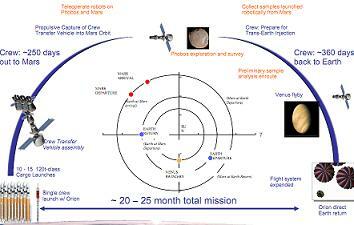 However, notional clues into what a Mars mission would look like can be found in documentation surrounding – and including – the extensive Flexible Path presentation (L2 LINK), content that lists a mission to the Martian moon of Phobos as the initial destination – including a close fly-by of Venus en-route. All notional human missions to Mars will require advances in life support systems, habitat modules for the journeys, potential advancements in propulsion technology, an array of hardware to be delivered to the surface, all launched by a fleet of Heavy Lift Launch Vehicles (HLVs) – known as the Space Launch System (SLS) – and a very large truck to carry the billions it would all cost. Some claim the political will would only become viable via an international agreement – not unlike the successful arrangement with the International Space Station (ISS). 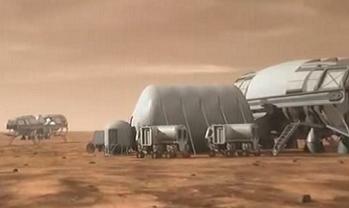 Others claim it would be a viable proposal through a commercial/private effort via the likes of SpaceX. Something that would help grease the wheels of the money men may arrive via Curiosity, should she find Martians – albeit is very tiny ones – during her exploration of the Red Planet. So long as she remembers to phone the President. (Images: Via NASA and L2). L2’s growing sections include presentations, videos, graphics and internal updates on Orion and other future spacecraft, all available no where else on a public website.